Lenovo, through its Subsidiary, Motorola Mobility has unveiled a new range of Moto Smartphones to core dealers in Nigeria at a groundbreaking event which held in Lagos. 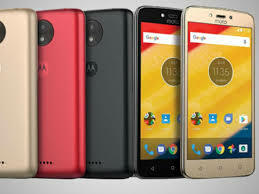 The smartphone models which include the Moto E4, Moto E4 plus, Moto C 3G, Moto C 4G and Moto C plus boasts of exciting new features and user-friendly applications. Motorola’s range of innovative smart phones guarantees consumers the opportunity to experience high definition display and cutting edge design at value prices. Speaking at the event, Shane Solomon, Head of Marketing at Motorola said, “It is indeed a great pleasure to be back in the Nigerian market to introduce this new range of smartphones. Our commitment to improving the mobile experience of our users has enabled this premium innovation we have launched here today. Nigeria is a huge market for mobile phones and it is a market for consumers who are constantly looking to more in terms of what they can achieve with their smartphones. Being the pioneer of the world’s first smartphone, we are excited about our presence in Nigeria once again and we look forward to delighting our customers through the Moto smartphones. We decided to launch the smartphones with our top dealers from all across Nigeria. With this engagement, they will have firsthand knowledge of the phones and our plans to make the phones available throughout the country,” he added. The Moto E4, Moto E4 plus, Moto C 3G, Moto C 4G and Moto C plus will be available to consumers at all retail partner stores in Nigeria. The brand has come to stay, with an end user experience that is different for the sake of being better for everyone.